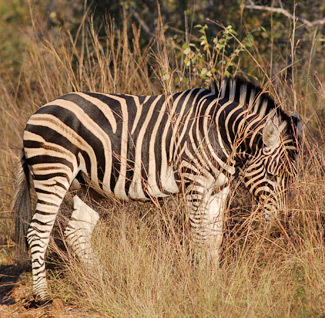 The lush grass that grows around the decomposing bodies of zebras that died from anthrax infection appears to play an important role in the transmission of the disease, researchers have found. Scientists found that zebras were attracted to the lush pickings, which were found to be rich in the spores which transmit the disease. The findings of the research were published this month in the journal, Proceedings of the Royal Society B: Biological Sciences. The multinational team of researchers carried out their study in Etosha National Park in Namibia. The bacterium behind anthrax is Bacillus anthracis. However, it is the spores produced by the bacterium that are able to enter the body of its victims and multiply. The spores are able to survive in the environment for long periods of time, with infection resulting from either inhaling the spores or through contact with broken skin. The resulting infection usually proves fatal. The researchers located and monitored 26 zebra carcasses in the park, half of which were found to have been killed by anthrax. Grass samples were taken periodically from around each decomposing animal and motion-sensing cameras recorded any action over a three-year period, during which the researchers were able to monitor spore levels in the grass. They found spores on grasses up to two years after death. Grass growing around the carcasses was found to be more lush, fed by the nutrients released by the decomposing animal. Zebras foraging around the carcass sites shifted from initial avoidance to attraction, and ultimately to no preference. The researchers found that zebras and other grazing wildlife were ultimately up to four times more likely to eat where a zebra had died within the last year than on random grassland nearby. The sites of the carcasses became less attractive 1.5 to 2.5 years after a zebra had died as the nutrient contents of the corpses receded. “Our results demonstrate that animal carcasses alter the environment and attract grazing hosts to parasite aggregations,” the researchers reported. They believe the research has important implications around the understanding of anthrax in grazing wildlife, as well as livestock, in anthrax-prone regions.